What is a Western Gray Squirrel? The Western Gray Squirrel or the Gray Squirrel, depending on region, is a tree squirrel native to the eastern and midwestern United States and to the southerly portions of the eastern provinces of Canada. As the name suggests, the Western Gray Squirrel has predominantly gray fur but it can have a reddish color. It has a white underside and a large bushy tail. Particularly in urban situations where the risk of predation is reduced, both white- and black-colored individuals are quite often found. The melanistic form, which is almost entirely black, is predominant in certain populations and in certain geographic areas, such as in large parts of southeastern Canada. There are also genetic variations within these, including individuals with black tails and black colored squirrels with white tails. 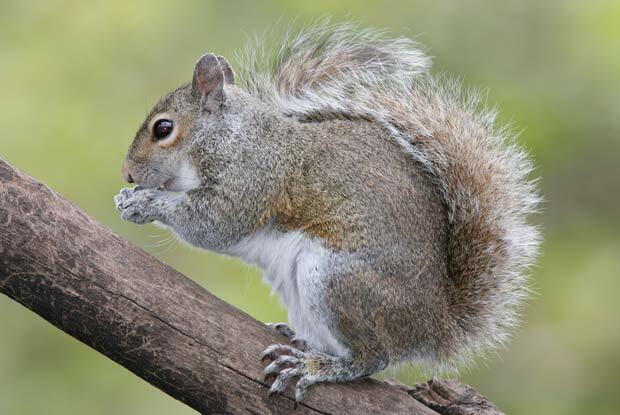 Like many members of the family Sciuridae, the Western Gray Squirrel is a scatter-hoarder; it hoards food in numerous small caches for later recovery. Some caches are quite temporary, especially those made near the site of a sudden abundance of food that can be retrieved within hours or days for re-burial in a more secure site. Others are more permanent and are not retrieved until months later. Western Gray Squirrels are more active during the early and late hours of the day, and tends to avoid the heat in the middle of a summer day. It does not hibernate. All species of squirrels are considered a household pest because they frequently enter attics in the winter; however, they rarely pose a health threat to homeowners. Outdoors, these squirrels can cause considerable damage to electrical and telephone cables.